Botox Barbie has lots of cool stuff! If Botox Barbie wants to get around Arizona, then she simply must have a plane! 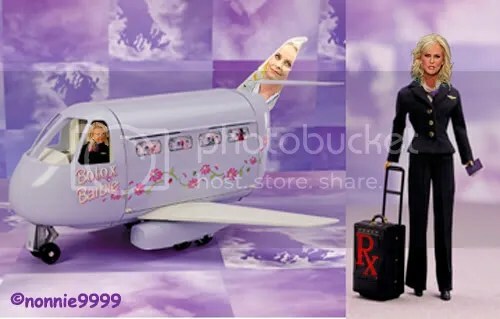 That plane will sure come in handy when visiting all of Botox Barbie’s cool houses! And now, here’s the newest member of the Captain Underpants Barbie Squad! 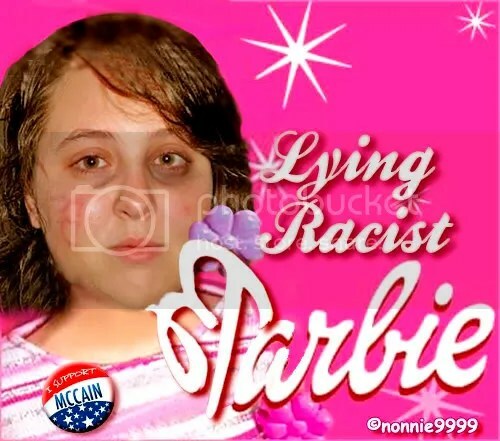 PITTSBURGH – A young McCain campaign volunteer made up a story of being robbed, pinned to the ground and having the letter “B” scratched on her face in what she had said was a politically inspired attack by a black man, police said Friday. Ashley Todd, 20-year-old college student from Texas, admitted Friday that the story was false, including the claim that the “B” stood for “Barack,” said Maurita Bryant, the assistant chief of the police department’s investigations division. Todd initially told investigators she was attempting to use a bank branch ATM on Wednesday night when a 6-foot-4 (1.93-meter) black man approached her from behind, put a knife blade to her throat and demanded money. She told police she handed the assailant $60 and walked away. Todd, who is white, told investigators she suspected the man then noticed a John McCain sticker on her car. She said the man punched her in the back of the head, knocked her to the ground and scratched a backward letter “B” into her face with a dull knife. Police said Todd claimed the man told her that he was going to “teach her a lesson” for supporting the Republican presidential candidate, and that she was going to become an Obama supporter. The young lady has issues, and I hope she gets the help she needs. End of story. But let’s talk in a little more depth about the eagerness and even glee with which some in the right-wing blogosphere jumped on that story and immediately claimed it as proof of their worst nightmares coming true. Andy McCarthy at the National Review’s Corner responded with a post so embarrassing he has now taken it down so nobody can see it. Noel Sheppard at newsbusters.org chastized AP for daring to be skeptical of the initial report. Most of all, he wanted to know why the AP didn’t report that the alleged perp was black. A lot of white Americans voting for Obama have had to overcome various degrees of racism to get themselves to that point. That doesn’t make them bad people; to the contrary, they’re thinking things through, and that’s great. However, for many of those people, an attack of the sort described by Ashley Todd would heighten those internal, emotional obstacles to voting for Obama. That’s precisely why some on the right — with notable exceptions such as Michelle Malkin, a person I do not ordinarily respect much — were so quick to try to make it a huge deal. so botox is why cindy lou looks so weird? 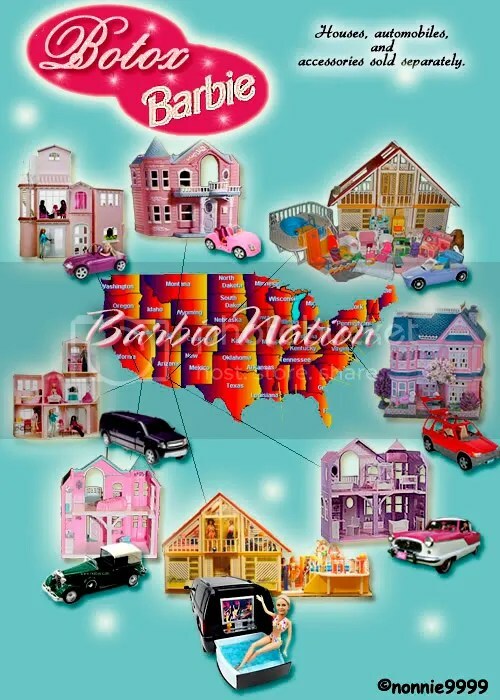 does her barbie car have plates that say ms bud, just like her real one? are you back home now? how was the vacation. i didn’t make license plates for the cars (if capt u wins, maybe he will throw me in jail and i can make license plates all day long). my computer is acting up, and photoshop has been horrible to work in. i had to skimp on some of the details so i wouldn’t lose the whole thing. 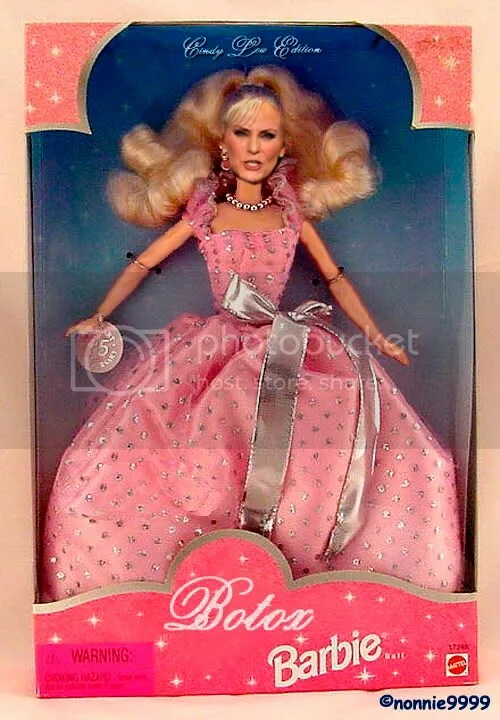 OK, I saw the Botox Barbie, Nonnie, and immediately got scared and dived under my desk (brrrrr). Then I read the story about the alleged assault and saw how eager people were to pick up their sheets from the cleaners and became even more frightened. It’s not even Halloween yet. Stop scaring me! Look again. Read again. LOL again! HAHAHAHAHAHAHA again! Except for one thing: McCain’s Hate Talk Express is “rolling along” on one wheel around here these days! It was posted, then poofed! you didn’t get caught in the spam filter, so it must have been a momentary glitch. i hope that the dems win really, really big in pennsylvania. one, because i want to win, and two, because it will highlight the fact that capt u was stupid for picking princess instead of someone like tom ridge. Nonnie, I know of two images that summarize what people think of the whole Ashley Todd incident. First, courtesy of the young folks in the obama 2008 community on LJ, this macro. The second is courtesy of Princess Sparkle Pony over on Blogspot. BTW, Princess Sparkle Pony has the following entry about Sarah Palin and her clothes. Glad you enjoyed Princess Sparkle Pony. Here’s her latest. Bwaa haa! Fabulous photo manipulation! What’s even better: The stupid little git who tried to pull this off may face a Class D felony, which will prevent her from voting!!!! Well, Ridge was a decent guy and governor on many fronts, but that was before he was tapped for Homeland Security. 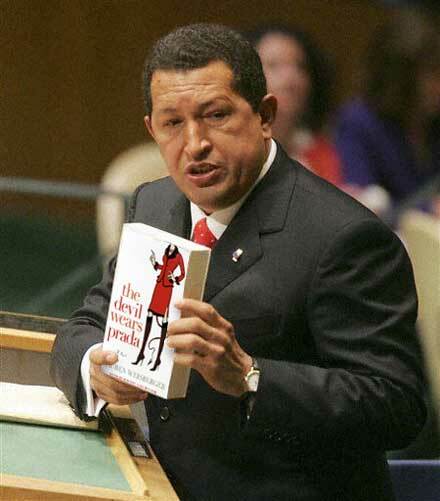 Prior to that, I heard him speak and met him at a technology conference I attended. It’s so different from seeing him on TV or the Tubes. I was very impressed. It seems that everyone – even good folks – who got sucked into the BushCo Negative Trait Amplification Machine (NTAM), got spit out later as toxic twisted shells of their former selves. How many times can one of your photoshopped pics be called CLASSIC? I sent this series all over the world- thanks, Nonnie. U R amazing. when tom ridge threw his lot in with chimpy, he abandoned his soul. i try to think that guys like ridge and mukasey walked into the chimpy administration in hopes of being the watchdogs who keep things under control a bit. however, they seem to kowtow to the administration on everything, and they lose whatever respect they might have had before. Gee… in that getup she sorta looks like Harriet Miers. Whatever happened to ol’ Harriet, anyway?